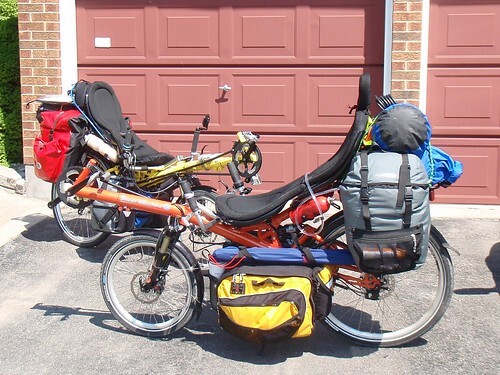 On June 2nd, 2008 we packed up our bikes for the first time and began our adventure with a trip around Lake Ontario. 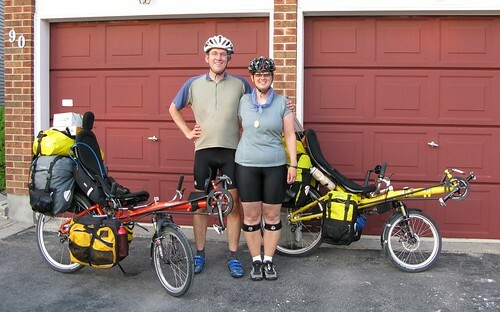 It is kind of scary to think that we have been off work and traveling by bicycle for over a year now. To celebrate this anniversary we are hopping on a freighter. We hope they have a good bottle of wine waiting for us. We also hope to write a few year in reflection posts as we while away the time crossing the Pacific. We are a few days behind, so you will need to wait in anticipation of our final adventures in Southern Korea. We are writing this from Hae-Undae Beach, so we still need to make our way across the metropolis of Busan and find the Busan New Port and our ship, the Hanjin Madrid. If you don’t hear from us until mid-June, then you know we succeeded in getting aboard! Busan provides a good summary of our experience in Korea: hills, construction, big roads, and massive blocks of apartment buildings – not exactly the most scenic or bicycle friendly country we have visited. It was neat to see, but we are glad that we were only here for a week. The traffic of Busan was not a problem for riding; however, navigating through the streets was. We often opted to change our routing to avoid hills, bridges, or tunnels; however, there were times when avoiding the hills and bridges was not possible. Riding up steep hills with traffic is not a fun venture – fortunately, when it was necessary we were able to find sidewalks so we could stay off the roads. We stopped for lunch at 1 pm and were only just at the half way mark (or what we thought was the half way mark). We realized that we needed to stop dawdling if we were to get to the port on time. Of course, shortly after lunch we came upon a massive hill that we could not find a way around – so up we went. In the end, it wasn’t as bad as we had feared. By 3:30 we were getting worried that we would not make it to the port on time. We knew the boat was not arriving until 7 pm, but we needed to arrive in time to clear customs before customs closed at 6 pm. Our appointed time to meet the agent was 4:30 pm. We came to a T-junction in the road with a large rock (AKA mountain) in front of us. We saw a sign for the port that said it was 14 km away – our GPS estimate said 4 km! With the hills we were only averaging 11 km / hour. The sign also pointed us in the opposite direction we thought we should be going. The directions on our computer agreed with the sign, but we checked with a local that said we could go the other way – which did appeared to go around the rock in the direction we knew the port was in. Of course, it did not take long for this road to lead us to another hill. By now, we were both rather tired and our stress levels were increasing. There were no gantries in sight – so we had no idea how far the port was. Fortunately, there were signs, so we had confirmation that would could at least get there from here! Screaming down the other side of the hill, the signs led us off the main road onto a side road. Unfortunately, the side road was not signed, so it did not take long for us to miss a turn. We pulled into a gas station and asked for directions. They confirmed we needed to be going in the opposite direction – at this point it was 4:20 pm and still no gantries in sight. Since the road was a divided highway with no place to turn around, we hopped back on our bikes and continued. As we approached a set of lights, we saw another sign for the port, telling us to turn left. After making the turn, we could see gantries in the far off distance, definitely a good sign. Again, we followed the signs leading to the port. There was water between us and the gantries, which meant we had to ride back towards the highway we had exited. We rejoined the road where we had missed the turn and entered what we thought was the port road. Becky rejoiced that it was 4:28 pm and we were nearing what we thought was the port entrance, only to be led around a corner and down another long straight stretch of road. Riding along, we saw a sign indicating the Hanjin port to be another 3 km down the road. After 2 km, we saw signs for the Hanjin office and the North Port, but the roads leading to this port were not yet built, and what was the “Hanjin office” looked like a bunch of temporary construction buildings. At this point, Scott was afraid that our first detour had brought us in the back way, and we had missed the gate where we were supposed to meet the agent. Not certain where the port entrance was, we stopped at the entrance to one of the new roads and asked the guard to call the agent for us (of course, this request was made mostly in mime as the guard did not speak English, and our Korean phrasebook didn’t include such useful phrases as “Can you please call the Hanjin port agent and tell him where we are?”). It took a bit of gestured explanation, since the number we had written down was the international variant, not the local Korean number. Finally the guard understood, and agreed to make the call. After a brief conversation with the agent, the guard indicated we were to wait there and the agent would be along shortly to collect us. Not 2 minutes later, Mr. Shin (the agent) drives up in his minivan. He informs us that the ship has been delayed and we will not be able to board until 10 pm, but he could clear us through immigration now. He takes our passports to customs and confirms that the gate we want is just another kilometer down the road. We decide to go and check it out. Originally, we thought we would ride back into the small town near the port (about 7 km), have a nice dinner, and then return to the port after dark. When the agent returned with our passports, he mentioned that would could just have a meal in the port cafeteria and hang out there until he returns at 10 pm. Since we had already ridden today much longer than we anticipated, we opted for the lazy option of dinner at the port. We had a typical Korean cafeteria meal and hung out for several hours until we could board the ship. The agent arrived promptly at 10 pm and we were permitted to follow his vehicle to the ship, rather than having to load the bikes up. He sped a long (we think perhaps testing how fast we could ride!) to the ship, which fortunately was at the closest birth to the port entrance. She was still docking when we arrived, so we watched the last lines being secured and the gangway being rigged. We immediately recognized Raymund, one of the crewman from our voyage on MSC Alessia, who confirmed that indeed we would have the same Captain as we had on MSC Alessia. Once the customs and quarantine folks cleared the ship and departed we clambered up the gangway to be greeted by a very young and bouncy Chief Mate who showed us to our cabin. While collecting our luggage, we were briefly greeted by the Captain. As the ship had just arrived, things were still pretty chaotic, so we headed up to our cabin to shower and crash for the night. So far, this looks like it will be another fun trip. Great view of the fog!